With the major shifts of the web, social media and mobile, and the levels of messaging they've ushered in, the nature and pace of change heralded by the age of technology is unprecedented. Since every new experience changes our brains, we set out to explore the question: What is looking at our inbox and phone 100s of times a day doing to our heads and, importantly, what does this ‘hyperstimulation’ mean for attention spans, cognition and brand recall? 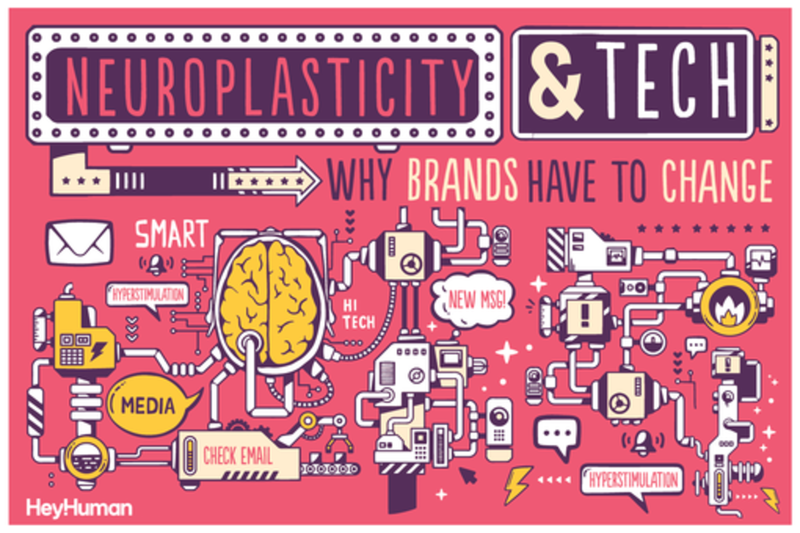 We will get specific about the concept of ‘neuroplasticity’ and share our latest research on how technology is fundamentally altering the way we connect. Working with neuroscience experts, we explore the challenge to marketers in the digital age – whether technology represents a new way of communicating, or if it requires us to communicate in new ways. As technology continues to dominate our lives, we will discuss our evolving relationship with it – and the ways in which brands can ensure they play a positive role in this process. Dan joined Hey Human – a London creative agency – in 2007 as a Senior Planner and now drives their strategic vision as Director of Innovation. Across his 18 year career, Dan has had varied roles across agencies beginning his career as an Account Man on Pepsi for Omnicom agencies before leaping the fence (thanks to D&AD) to become a Creative and Creative Head. Throughout his career, Dan has pioneered several firsts including EMEA satellite and mobile tracking campaigns for Budweiser and KitKat, the first ever furniture concept for Moet & Chandon champagne and ground-breaking AR for Glaxo Smithkline on Lucozade Energy bottles. Dan has also picked up accolades for Unilever, Eurostar and Glaxo Smithkline, with ISP(Grand Prix), MAA Best, IMC(Grand Prix) and Reggie Awards. Dan is a speaker and thought leader on the evolving relationship between technology and humanity. In his current role, Dan’s mission at Hey Human is to ‘humanise technology to empower positive human behaviours’. Felix works in strategic innovation for a group of UK creative agencies called HeyHuman. He has over 4 years experience advising blue chip clients (Sony, Unilever, Mars, Mondelez, etc) on the relationship between people's behaviours and technology, and the role brands can play to influence it. He focuses on understanding behaviour change using emerging technologies and is an expert in helping brands to connect with their audiences with humanised technology. He is an industry thought leader, having had pieces published in M&M Global, Marketing Week, Brand Republic, the IPA and more. He has won numerous awards for his work including an MAA award and 4 IPM nominations (including best innovation).